A Tourist's Guide to Famous Instagram-Worthy Spots in Sydney and Canberra - Holy Smithereens! Hello there, November! Well I don’t mean to get everybody in a panic, but you do know that December is happening just a handful of sleeps from now, right? No matter where you are, December brings in a lot of celebrations and holidays for the end of the year. But allow me to say that perhaps no other place is as busy, fun-packed and festive as Australia in December. As such, November to February is an amazing time to visit Australia. If you’re visiting Australia soon, a friendly yet important reminder that I can give you, is to ready yourself with a great-value mobile plan. After all, you’re visiting Australia at its most photogenic season and it would be a complete waste to not be able to upload your photos on Instagram and other social media channels in real time. And while Australia has wonderful hotels, free wi-fi is unfortunately still not the standard for all hotels. So I highly suggest you have data ready to go on your mobile device. For temporary visitors, I’d suggest a prepaid SIM plan that doesn’t include a contract. And yes, I know there’s a myriad of information on sim plans out there. For some of the best-value around, check out amaysim’s mobile plans, they have a number of plans with varied data allowances, as well as unlimited talk and text within Australia – the perfect option for travellers! Now that we’ve got the ‘serious’ stuff sorted, let’s get to the fun part! I will focus on just a few tourist spots (my personal favourites!) and give you different shots / angles that I think are a must to post on Instagram. The Sydney Opera House is undeniably Australia’s national icon that’s recognised worldwide. It is one of those touristy spots that you must visit (and take a photo of) when in Sydney. And I honestly have to say that the Opera House is one of those touristy spots in the world that is worth more than the hype, and I never ever tire of seeing it. Everyone has surely taken a shot of the Opera House during the day. While the Opera House is photogenic any given time of the day, there’s a certain ethereal glow it possesses after the sun sets. It sometimes looks like a moon, or a crystal ball, depending where you are. This shot was taken at around 8PM on a February. I was onboard a boat that cruised around the harbour, the M/V Olympic Storm. The cruise just finished and we were heading back when I saw the stunning welcome of the Opera House. Tip: Most people take shots of the Opera House from Circular Quay. Taking one of the ferries to / from Circular Quay will allow you to take a shot of the Opera House from the water, which is a slightly different angle. There’s an almost otherworldly glow that the Opera House has when lit at night. Especially when viewing it from above. More specifically, from a hotel room with a strategic view of the Opera House. This shot was taken from a harbour-facing room at the Shangri-la Sydney. Visiting the Opera House and seeing it up close is a stunning experience, but to end your day and sleep with the Opera House as your “night light” is really something else. Taking a photo of this view for Instagram purposes is obviously recommended, but I can assure you that even if you forget to take a snap, the experience itself is already worth it. Tip: there are several hotels around The Rocks / Circular Quay area. Yes the rates can be pricey but I suggest you look out for special rates and book ahead of time. If you can’t get enough of the Sydney Opera House (like me! ), this is a splurge that is well justified. In relation to Sydney Opera House tip #2 above, when I say that the price point of hotels around the Opera House can be justified – I mean that because of the amazing views of the harbour, you will almost never want to leave your room. It can be tempting to just order room service and watch the action around Circular Quay as the sun sets. Just don’t forget to take that photo and upload. Tip: A lot of cruise ships dock in Sydney, and they do so at the Circular Quay. Always have your camera ready as it can be interesting to watch giant cruise ships sail slowly in and around the Opera House. The exterior of the Sydney Opera House has been photographed from every angle possible. But its rare to see shots from inside the Opera House. Uploading photos on Instagram isn’t just about perfect, inspiring photos. You are an expert level Instagrammer if your photos also aim to educate and inform your audience. Not many people know what the inside of the Sydney Opera House looks like. Tip: You can join one of the tours of the Opera House. Or hit two birds in one stone and book a concert / musical / play. I think it’s fair to say we have covered almost all bases of the Opera House. It’s time to move to my next favourite Sydney tourist spot: The Harbour Bridge. Call me biased, but there’s no other city or airport in the world that offers this kind of amazing view during landing. The Sydney Kingsford Smith International Airport is only 10-12 kilometres from the city centre (where the main tourist attractions are – Opera House, Harbour Bridge, Darling Harbour, The Rocks, etc) so tourists and locals coming home alike are both welcomed by such an incredible view. While the Harbour Bridge is the main subject of the shot, you can actually see the Opera House also in this photo. Tip: This is a good time to grab the window seat. And get a flight that lands during the daytime. The close proximity of the Sydney Opera House and the Harbour Bridge makes it easy for tourists to visit both in one day. Tip: It’s a cool bonus if there is an occasion / celebration in the area in order to give an interesting theme to the shot. If you are going to visit Sydney for New Year’s, this is the shot that you must take. If you fail to get a shot of the Harbour Bridge with the New Years’ Eve fireworks, I insist that you hop right back on a flight to Sydney. There are many iconic New Year city countdowns, and Sydney probably the most popular, and is on the list of many people’s New Years’ bucket lists. For fireworks shots like this, I would suggest using a mirrorless/ DSLR camera. I was going to suggest a point and shoot at the very least but realised that most phones are better than point and shoot cameras these days. Tip: Book your Sydney New Year’s spot in advance. This shot was taken from Luna Park. Those who visit Sydney and have a spare day or two find themselves getting on a bus to Canberra. Yes, people visit mainly for museums and to see what the Australian capital is all about. I haven yet to upload this photo that I took when I was out for a run. This is around Lake Burley Griffin park in Canberra, a famous spot to run / jog/ workout. Even though Lake Burley Griffin is manmade, the sunset view is just marvellous, and it adds an added kick to your runs. Tip: visit LBG close to sunset. 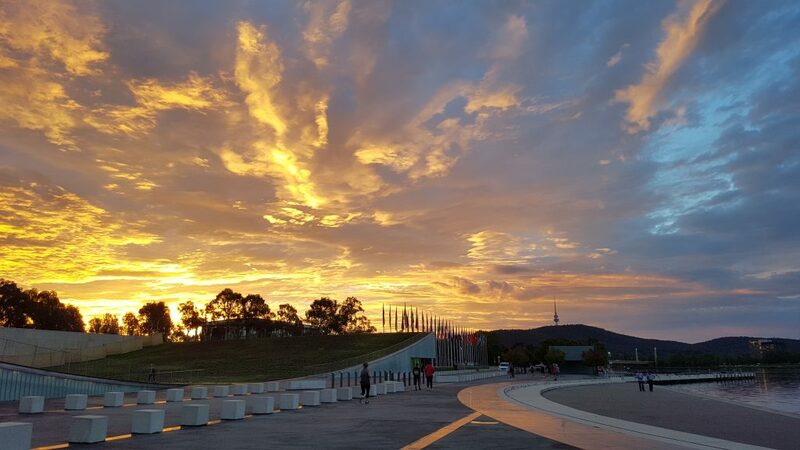 The Canberra skies are just fantastic. Canberra’s excitement lies in its food scene. The bigger cities around Australia, while they may have more attractions and events, and may have more restaurants and cafes, have a ‘hit-or-miss’ possibility of having real quality food. Canberra’s cafes, brunch spots and restaurants have a more curated appeal and to be honest I have not been to a place around Canberra that disappointed me. One of the best brunch places in Canberra is Muse, a unique bookstore-cafe concept found at East Hotel at the Manuka Shopping Precinct. Tip: be sure to arrive on time and book reservations (if available). The brunch places can get quite crowded. Sure the Colour Run is held in 10 other cities around Australia. But the colour contrast is more stark in Canberra, not to mention that it isn’t as crowded as the bigger cities. This shot was taken at the Commonwealth Park, when most participants have finished the run. Tip: Be sure to take a protective case / covering for your phone and camera so that the dye powder (flour-based) won’t damage your gadgets. These are just a few of my personal favourite spots to take photographs of around Sydney and Canberra. I hope they’ve been helpful and will get you ready to snap and upload anytime, anywhere around Australia. This post was created in partnership with Amaysim. All opinions, tips and photographs are my own.